4 Comments on "Trump Asks After Bernie’s Cheered By Fox Audience ‘What’s Wrong With Fox News?’"
Bernie rocked on Fox. Let’s see if any other Dem candidates gets it. Hi Shockwave! I love it that Trump is terrified of Bernie. It totally made my day. Biden makes him nervous as well and I don’t want to think how he’ll behave with Buttigieg. This is getting to be a controversial topic. 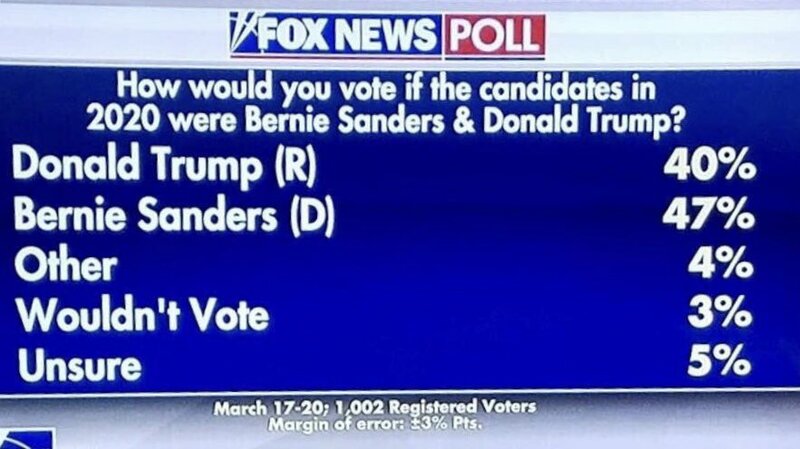 On one side of the fence, anti-Bernie people are saying that he shouldn’t be cultivating bigots, and I see that point, and on the other side of the debate is the thought that if you give Fox viewers some sanity, maybe you’ll lead them to right thinking.